Time soldiers on, but some things never change. 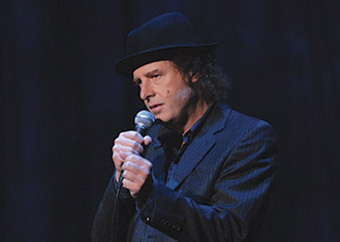 Steven Wright, the deadpan comic of wry and bizarre observation, is back in “Steven Wright: When the Leaves Blow Away,” which apparently aired last October but was just released on DVD. Comedy Central aired it again last night. It’s Wright’s first stand-up comedy special in 16 years. Has it really been that long since “Steven Wright: Wicker Chairs and Gravity”? Geez. I’m getting old. I knew it had been forever since I’d seen any new stand-up from Wright on TV, but 16 years? Wow. Wright’s deadpan delivery of the downright odd makes him an acquired taste. His style is that of a rambling crazy person dialed down to apathetic slow-motion. His jokes can essentially all be described the same way: an endless series of non-sequitur pouring from a stream of consciousness. He doesn’t tell any story that lasts more than a few sentences. Many are one sentence. He has no transitions from one random thought to the next. Curiously, his complete disregard for building jokes based on sustained momentum creates its own momentum: the randomness keeps going on and on and the cumulative effect is a hilarious momentum defined by its escalating aimlessness. Of course, Wright’s thoughts aren’t really “random”; they’re finely tuned material that merely has the appearance of random incoherence. But this strategy works as well now as it ever has. But Wright’s material and presentation reveal a stage persona that could stay the same forever. Because in an isolated universe that is made up of cleverly insane thoughts built on wry irony and double-reversing logic, there’s no need to upgrade the style or the format. The material is fresh and that’s all you need. If you enjoy oddball, yet brilliant stand-up in the form of non-sequiturs, you should check out Mitch Hedberg. He may seem like a stoner, but his humor is some of the cleverest I’ve seen. I caught that show too, and it occurred to me that part of the key to Wright’s humor is the musicality of his delivery. Despite his seeming monotony, there are some definite rhythms and syncopations to his style of patter. I found myself laughing hardest not at the most clever witticisms, but at the one where the flow of words came out just so. That guy is connected to something; what, I’m not sure I want to know.